2. 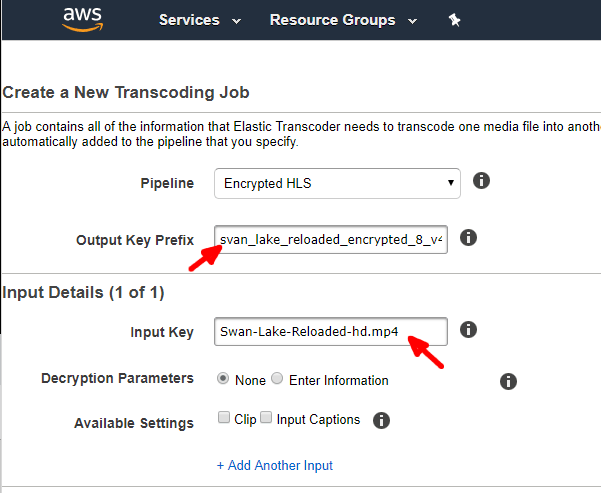 You have a working encrypted HLS setup assording to the steps in How to setup encrypted HLS stream with Amazon Elastic Transcoder. 3. You uploaded your high quality original video into your S3 bucket already. 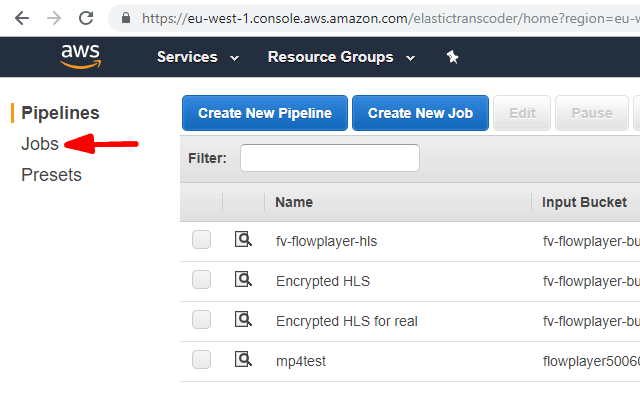 We assume you know which S3 bucket is used as the input and output for your AWS Elastic Transcoder Pipeline. 1. First you need to find the previous video encoding job. In this guide we just clone that - saving you a lot of time. 1.1. 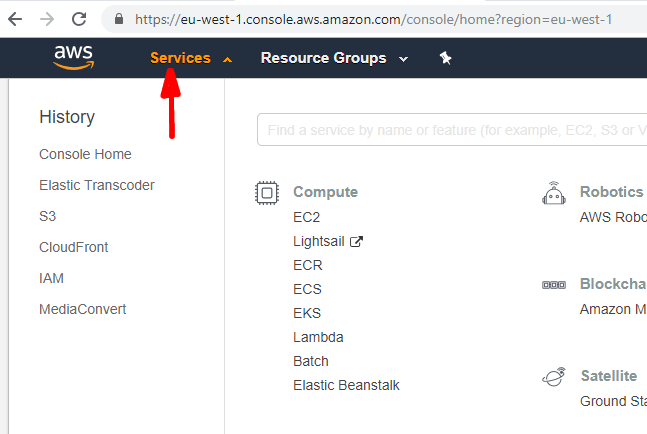 Using the AWS Services menu navigate to Elastic Transcoder. Since there is a lot of services you can use the search field which is present. Or you might find it in the History section if you accessed it recently. 1.2. 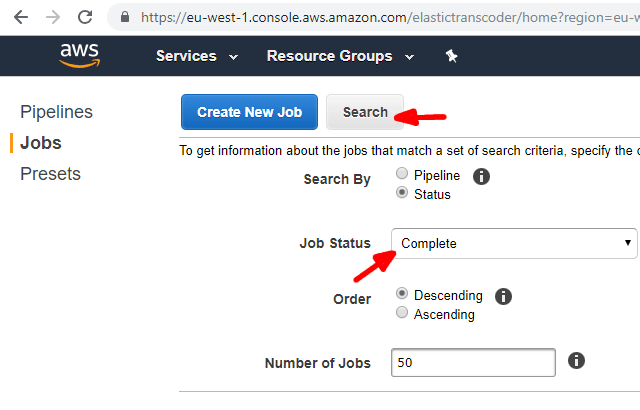 Next go to the Jobs section of Elastic Transcoder. 1.3. Remember that at all time you have to be in the right AWS Region. If you encoded your video in Ireland, you won't find them in any other region, so make sure you set that properly in the top right corner. 1.4. In the Jobs section you can filter by either the Pipeline it used or the Status. In the first case pick the Pipeline and in the later case pick "Complete". 1.5. 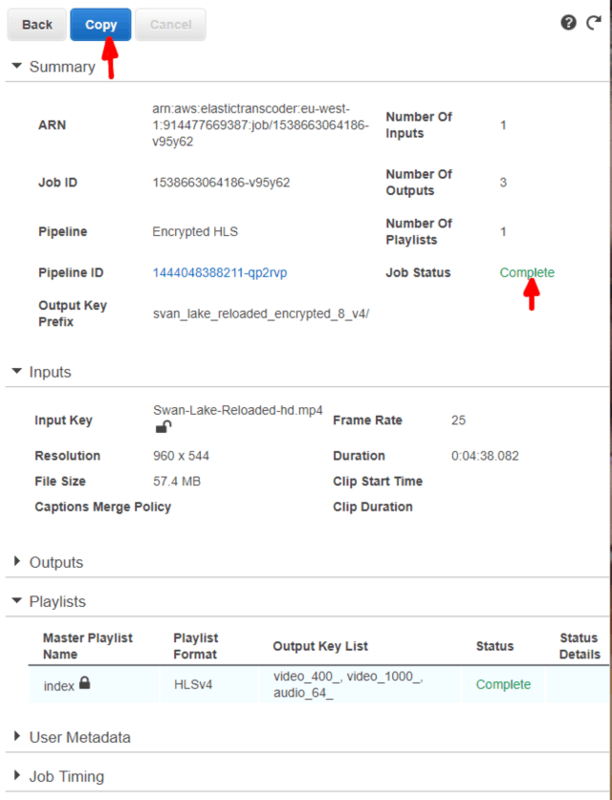 You will get a list of the encoding jobs, pick the one which you used to encode your previous video. If you did a bunch of tests make sure you pick the one which is the right one. If you are not seeing it, then double check your Region (see step 1.3.). Or perhaps you encoding job has failed and didn't finish properly. 2.1. You need to hit the Copy button to create a new encoding job. 2.2. Enter new Output Key Prefix (you can replicate the Input folder structure there). Important: Note that it has to end with / symbol as it needs to be a directory. 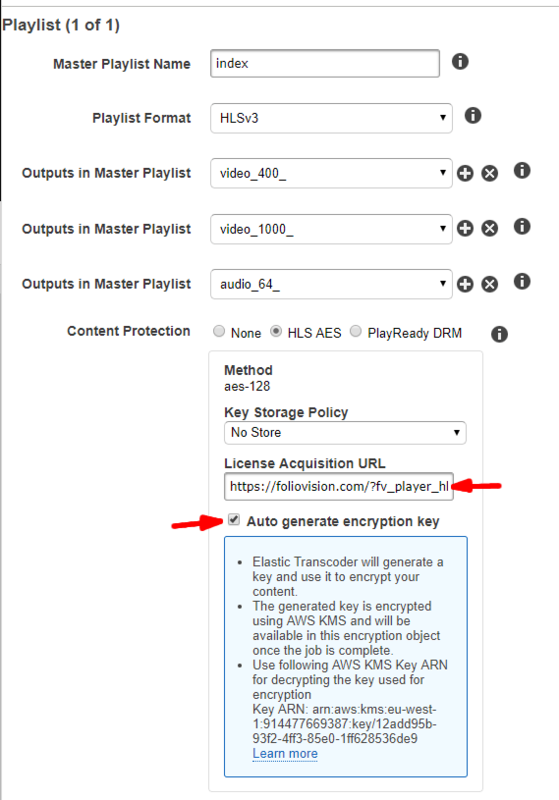 Important: It has to be unique, no other HLS video on your website can use the same Output Key Prefix as otherwise the encrypted video might not play. So using something generic such as "lesson-1/" or "video-1/" is not a good idea. Fortunately clicking the Output Key Prefix field gives you a quick listing of the output bucket content, so you can check. 2.3. Pick the video file you want to encode using Input Key. You can only pick from the S3 bucket for which the Elastic Transcoder Pipeline was setup up. 2.4. Going further down enter the new License Acquisition URL. This URL consists of your homepage URL, the query argument name and the value of Output Key Prefix and Master Playlist Name. Important: It has to be unique, no other HLS video on your website can use the same combination of Output Key Prefix and Master Playlist Name as otherwise the encrypted video might not play. So using generic Output Key Prefix such as "lesson-1/" or "video-1/" is not a good idea. 2.5. Also check Auto generate encryption key. Now you can hit the Create New Job button. 3. Now you can see a screen with the Job Status which will say Submitted. You can reload this screen until it says Complete. 4. Once the job is complete point your mouse at the closed lock icon next to any of the Output Key items and you will see a popup with Encryption Key. You need to copy that Encryption Key and keep it ready for the next steps. 5. Now is the time to finally insert the video on your website. Bring up the FV Player editor and either paste in the HLS URL or use the Add Video button to bring up the WordPress Media Library. 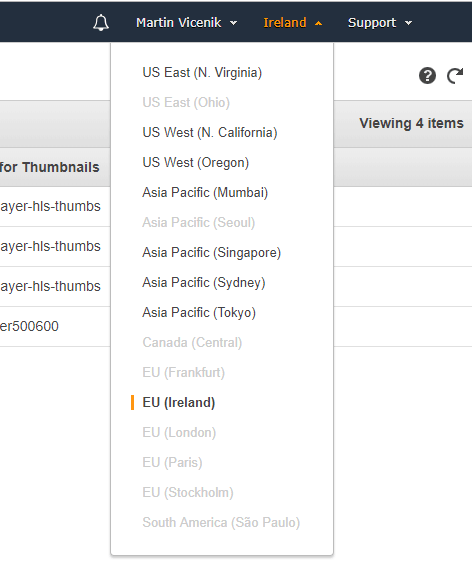 In the Media Library you can click the Amazon S3 tab and pick the index.m3u8 file of your newly created file there. Just make sure you pick the right S3 bucket and navigate to the right folder - matching the Output Key Prefix from before. 6. 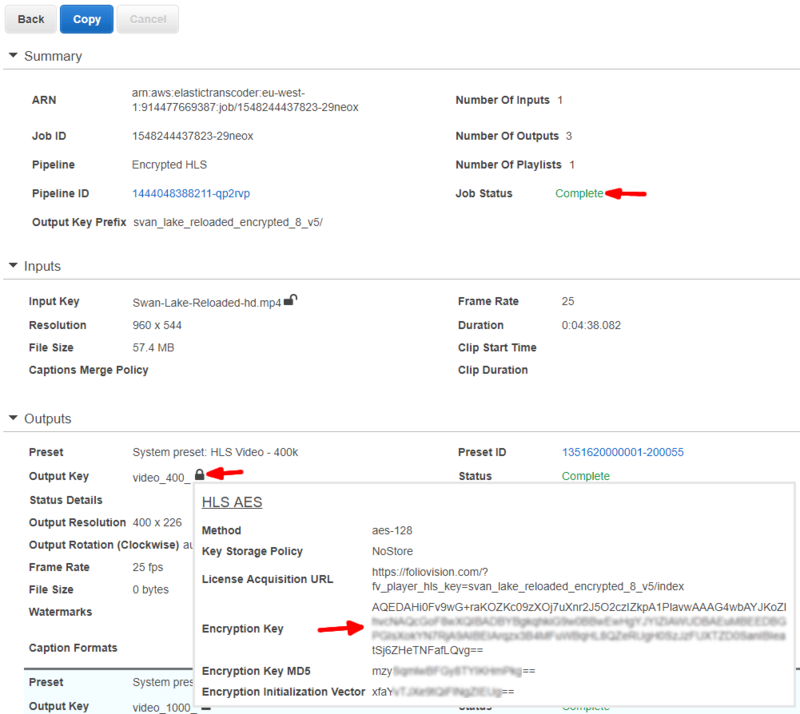 Now you need to paste the Encryption Key from step 4. into the "Encryption key" field and hit the Decrypt button. 7. Then the "Decryption key" field will be filled with the actual Decryption Key. 8. Finally that's it, you can just insert your video to a page and watch it play. Note: the actual preview in the FV Player editor will not work until you save your video.